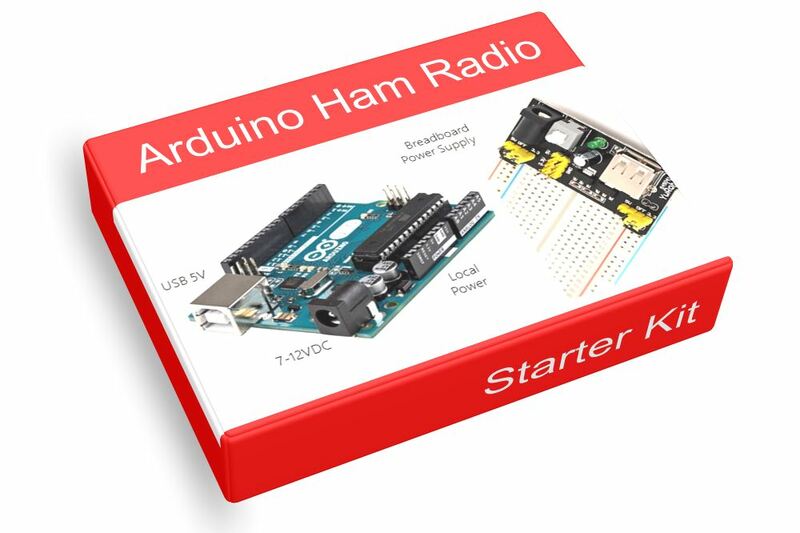 Hams are used to powering homebrew projects with 12 volts, maybe more. With ham Arduino power, you enter a world dominated by 5 or 3.3 volts. Most beginners start by powering their projects with the same USB cable used for programming and communicating with the Arduino. USB can provide up to 500 ma of usable power. Usually this is enough to get you going. But what about when your project is not connected to the computer? You have three choices. First, you can still use a USB cable for power only. Just connect it to a wall wart. Second, use an external power supply of up to 12 volts connected to the 2.1 mm barrel jack. Batteries work fine, as well. Lastly, you can set up a 12VDC power bus on your breadboard, and connect it to the Vin pin on the Arduino. Use caution, though, as there is no polarity protection on this pin. When your project needs less than 400 ma of 5 or 3.3 volts, you can power it from the Arduino board. If your project needs more than this, you can power the Arduino and peripheral components separately. Keep in mind that many peripherals you might interface require 3.3 volts. TFT displays and sensors in particular have this requirement, and typically are not 5 volt tolerant. Some folks make extensive use of a bi-directional logic level shifter; others build their own voltage droppers. Beginners should read Sparkfun’s How to Power a Project, as well as Open Electronics Feeding Power to an Arduino before going much further. I found these sites particularly useful in understanding power strategies for Arduino projects. Thus far, I have used a variety of power strategies. These include USB from computer, USB from wall-wart, 12V external, bench supply at 12 and 5 volts, and the little Breadboard Supply which easily creates both 5 and 3.3 volt buses. Measuring current drain is particularly easy with a bench supply. The main thing to learn is the current limitations of your Arduino board. In general, Arduino can source or sink 200 ma globally and up to 40 ma per I/O pin. When I am concerned about current, I typically add a voltage regulator to my PCB so the Arduino regulator has less work to do. And of course, circuits for high current devices like motors should be powered separately. For example, an Arduino can provide control voltage for a servo motor, but the servo should have its own power source. Shortly in this Starter Kit, we will focus on inputs, outputs and displays.